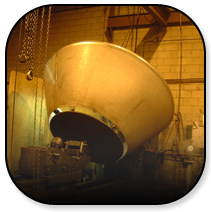 Cones & Special Shaped Tank Ends – Clark Kennedy Co. Inc.
Clark Kennedy Co. Inc. can roll a flange on customer-supplied cones of varying depths from 10 gauge to 1/2″ thick and up to a 12 foot outside diameter in carbon and stainless steel. We can supply in-between style heads for your custom design needs (various combinations of dish radii and corner radii can be accommodated). Our equipment and operators are flexible. Please feel free to contact us to discuss your needs. Click here to start the quote process for this product.